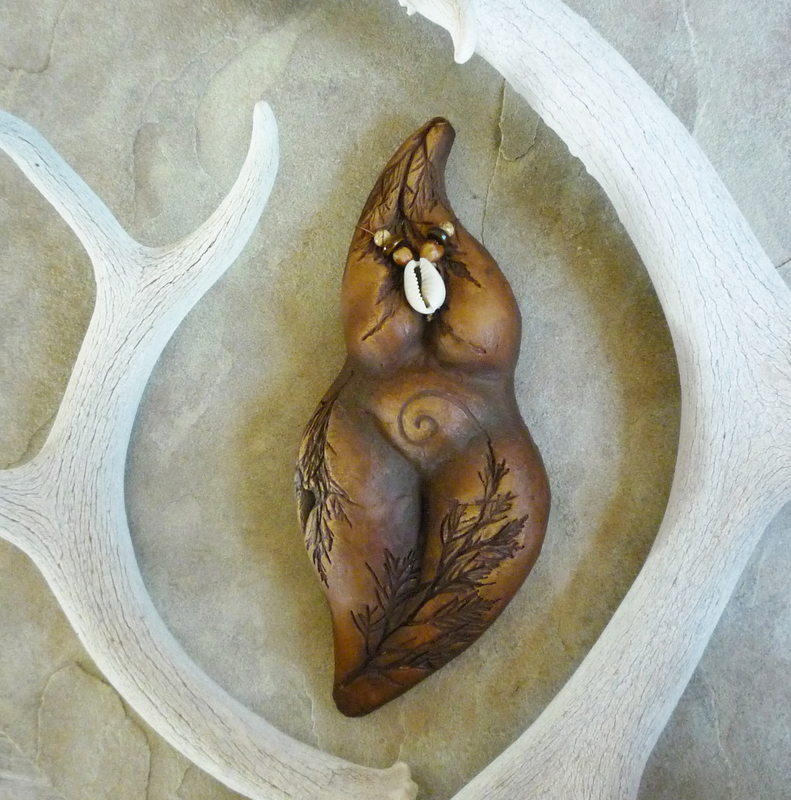 Shawna Hawk Rose, an artist based in New Mexico, creates a rich variety of sculptures, jewelry, and other items devoted to themes of Sacred Earth Mother Goddesses and Yoni art. One such sculpture is that of Pachamama, the important earth goddess of Andean culture whose origins date back to the civilization of the Incas. Previously discussed on Visualizing Birth, the name Pachamama means “Mother Earth” or more aptly, “Mother of All,” and is connected to themes of fertility, birth, and the universal figure of mothering. The smooth, round shapes of Rose’s sculpture of Pachamama are soothing to those who view it, and the figurine is small enough that it can be held in the hand during pregnancy, labor, or birth itself. Talismanic objects used in birth are not unheard of and can bring calm, empowerment, or protection to the woman as she approaches birth as a rite of passage. Through the figure of Pachamama, the small sculpture also connects its viewer or holder to the earth mother goddess, a powerful figure whose presence reminds women that there is a lineage of birth across time, history, and culture. Many women throughout time have given birth, and knowledge of this lineage of birthing women is encouraging and calming for the pregnant woman if she feels alone as she approaches the journey of labor and birth herself. Shawna Hawk Rose expresses her vision of “Rebirthing the Sacred Feminine” through her sculptures in fired clay and mixed media. Her sculptures are created for healing, creative empowerment, women’s blessing circles, doula and midwife gifts, ceremony, and altar tools. They have been collected throughout the USA and internationally. Rose offers her Goddess art, jewelry, and figurative sculptures on her website, www.SacredFeminineArt.com. Shawna earned a Fine Art degree in studio art from the University of New Mexico. Her home and studio are nestled amongst the Ponderosa pine trees of the Manzano Mountains of New Mexico, USA.